Middle Island, in the Miramichi River, is located approximately 2km east of downtown Chatham and comes into view as one travels along Water Street going east. It lies between Beaubear’s Island to the west and Sheldrake Island to the east. In 1829 the Island consisted of 18 acres of “arable land”, while today, considering the natural erosion over the years, Middle Island has been reduced to approximately 15 acres. The shape of Middle Island has been compared with a well-known Chatham site called The Lake. One legend with an Irish connection, told how leprechauns moved the soil around to create Middle Island and The Lake. Another told of the devil, in a fit of anger, taking a piece of ground and throwing it into the river. This piece of ground formed Middle Island and The Lake at the same time. A similar tale told of a giant who stepped on soft ground causing it to reappear in the river to form Middle Island, while The Lake was formed from his footprint. Early records relate that the Island was known by the Micmac name, “Hiksenogowakun, meaning place for sick people.” It was also named Hospital Island in relation to its use as a quarantine station. A.D. Shirreff called it “Barrataria” when he established a fishing business there in 1827. In 1827 A.D. Shirreff petitioned for his grant of Middle Island. He had already spent a considerable sum of money for improvements on the Island, including clearing the land, forming boomage and erecting buildings. Tragically, Shirreff suffered a setback in 1828 when fire broke out on the Island and completely destroyed his house and sawpit. 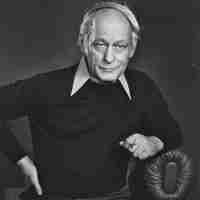 Fortunately, no lives were lost and A.D. Shirreff soon recovered from the loss to continue his business. In 1830 he officially received his grant of Middle Island for which he paid the sum of thirty pounds. At that time a survey made by James Davidson Esq. 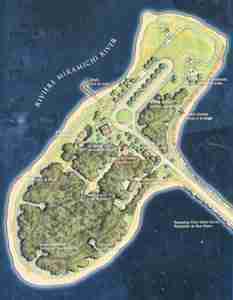 claimed the Island contained 18 acres. By 1833 Shirreff had established a depot for packing and shipping gaspereaux for the West Indies. The fishing sheds which were on the North East corner of the Island, were made of scantling, boards and plank and were of sufficient size to hold 1000 barrels of gaspereaux at a time. These were contained in tanks in the centre of the sheds, with a driveway for carts for conveying the fish on each side. 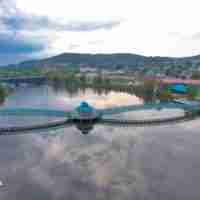 The fish were shovelled with wire shovels from the carts into the tanks. The fish were caught by seines run out from the North East and South East corners of the Island, which, when full and the tide falling, were drawn ashore by horses. Thousands of barrels of these fish were sent by schooners directly to the West Indies; the return cargoes being rum and molasses. 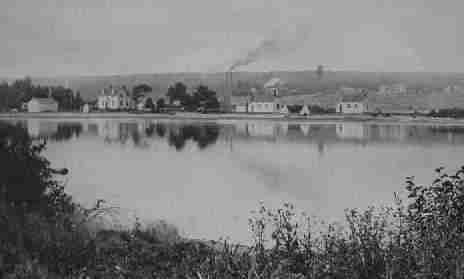 Reports of ship arrivals appeared as early as 1826 at the Port of Miramichi. There had been no particular attention paid to the need for a permanent quarantine station but as ships were arriving with passengers suffering from disease, officials called for immediate action. It was decided at a special sessions meeting that a lazaretto was to be immediately erected on Sheldrake Island to accommodate immigrants suffering from contagious diseases. As ships arrived with passengers in need of quarantine facilities, Sheldrake Island was still not ready to accommodate the immigrants and a hurried decision was made by the Magistrates to build the lazaretto on Middle Island. 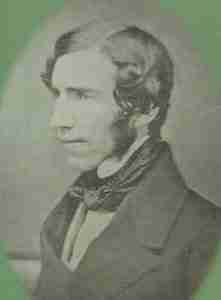 In 1847 as Perley cautioned, there was a mass exodus of immigrants from the British Isles to North America. The main cause for the migration was the potato blight that struck Ireland’s potato crop in 1845. Many families were forced to leave their homeland in exchange for survival. Passengers were crammed into the cargo holds of ships, charged a lower fare by unscrupulous ship owners, who were eager to cash in on the misery of the grief-stricken famine passengers, and showed little concern for their comfort and safety. These ships became known as famine ships. The ship Looshtauk was built at the shipyard of Lovett and Parker in Tynemouth Creek, near St. Martins. It was launched on the 17th January, 1845 and was towed into the Saint John Harbour later that year. The official builder’s certificate shows: burthern: 630, 322/3500 tons, Master: John Thain, one deck and beams for a second deck; three mast; length from the inner part of the main stern to the forepart of the stern aloft is 137 feet two tenths, breadth in midship is 27 feet seven tenths, depth in hold at midship is 20 feet four tenths. She is a Carvel built ship, rigged with a standing bowsprit, square sterned, no galleries, a woman’s bust head. Subscribing owner is James Alexander of Saint John, New Brunswick, aforesaid merchant with 64 shares. In 1847, the peak year of the Great Potato Famine in Ireland, Capt. 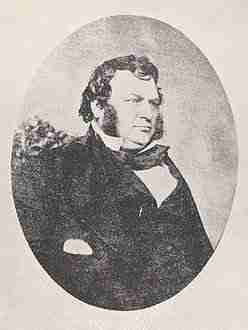 John Mount Thain was assigned to sail the Looshtauk from Liverpool to Quebec. He picked up his crew and, with their help, stocked the ship with the necessary supplies for an average five to six week voyage across the ocean. On 17 April 1847 four hundred and sixty-two passengers boarded the Looshtauk to begin a journey to Quebec.The last recorded sailing of the Looshtauk, according to Lloyds of London ship register, was in 1859 with J. McMillan as captain and W.I. Wilson as registered owner. The voyage was to Quebec. Typhus and scarlet fever broke out among the passengers, and spread rapidly through the ship. Captain Thain made a decision to head for the nearest port (Miramichi) to obtain assistance for the sick and dying passengers. TheLooshtauk anchored in the Bay on June 2 waiting for permission to land the passengers at the quarantine station. The Captain went to the wharf in Chatham and spoke to the Magistrates about his predicament and the necessity for immediate assistance. One of the men who had gathered at the wharf was Hon. Joseph Cunard. When he heard of the horrific conditions on board the vessel he informed Captain Thain that he would instruct the commander of one of his steamers to tow the Looshtauk up the river to Middle Island. Joseph Cunard’s presence on the Miramichi in the early 1820’s was welcomed. 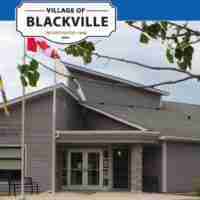 He gave the town a much needed lift and made a notable contribution to its growth. 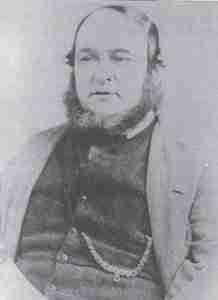 His undertakings included mill establishments, stores, brickworks, lumber and fish markets, a counting house and shipyard. Some of the finest built ships in New Brunswick were launched from Cunard’s shipyards. His empire extended beyond Northumberland County into Restigouche, Gloucester and Kent Counties. In 1835 A.D. Shirreff was in financial difficulties and became indebted to Joseph Cunard and Company for a sum of five hundred pounds. That year, to cover his debt, A.D. Shirreff signed over Middle Island, which included his fishery and other property, to the Cunard Company. 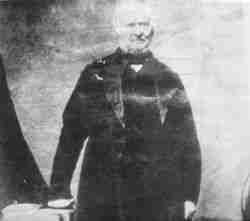 In 1847 when the Looshtauk was in need of assistance one of the men that Captain Thain spoke to at the wharf was the Hon. Joseph Cunard. When he heard of the horrific conditions on board the vessel, he informed the Captain that he would instruct the commander of one of his steamers to tow the Looshtauk up the river to Middle Island and provided an authorization note for him to do so. The Island was rented from Joseph Cunard on an as required basis since the Justices didn’t want to pay rent year round if the Island wasn’t required for quarantine purposes. It was a sad year in 1848 for the Town of Chatham and the Hon. Joseph Cunard when the solicitors for Joseph Cunard signed and released a notice of his bankruptcy. After his failure, Joseph Cunard returned to Liverpool, England where he remained active in the business world. 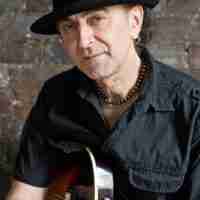 He died of heart disease in Liverpool at the age of sixty-seven years. The Justices were totally unprepared for the magnitude of the disaster. Emergency sessions were held to make the necessary arrangements to prepare Middle Island to be used as the temporary quarantine station. It was not until six days later that Captain Thain received permission to land the passengers on Middle Island. Dr. John Vondy, age 27, had recently set up his practice in Chatham, and when the Looshtauk emergency arose he closed his practice to devote full attention to caring for the fevered passengers landed on the Island. His own health was neglected and rapidly declined until he was too weak to handle the enormous task he had accepted. Dr. Vondy died after being on the Island a short time. His remains were placed in an air-tight double coffin and taken to St. Paul’s Cemetery in Bushville. Captain Thain also contracted typhus, and after being in a state of insanity for 15 days recovered, and sailed on to Quebec. Middle Island was again quiet by the end of September, with no sign of the great tragedy that had just occurred. Of the 462 souls who embarked at Liverpool, 146 died on board and 316 were landed on Middle Island. Of those who landed, 96 died on the Island, 53 went on to Quebec and 167 were discharged at Chatham. In 1873 Middle Island was finally designated as the site for a permanent quarantine station. Two hospitals, a caretaker’s home, lighthouse, light keeper’s home, boathouse and wharf were erected. The lighthouse was located on the north side of the Island, a short distance from the caretaker’s house. The light keeper raised and lowered the lamps with the aid of a pulley that worked similar to raising and lowering a flag. When the lamps were lit, they were raised to be visible to all ships entering the Miramichi River. The lighthouse remained in operation until 1937. Located near the centre of the Island, the house was built in 1873 to house caretakers and their families. The downstairs featured a large kitchen, a back kitchen and two living rooms. The upstairs had three bedrooms, a large hallway and a bathroom furnished with a large claw-foot bathtub. The family’s water supply was pumped from a nearby well to large holding tanks. The caretaker was responsible for making arrangements for river pilots to guide ships up the unfamiliar waters of the Miramichi River. At times, when a ship entered the river with a raised yellow flag, it indicated there was sickness on board the vessel. Immediately the quarantine doctor was contacted and he would examine any sick seamen aboard. If communicable disease was diagnosed, the afflicted person would be placed under quarantine for treatment at the hospital on Middle Island. After serving the necessary quarantine period, he would then be discharged and free to leave the Island. 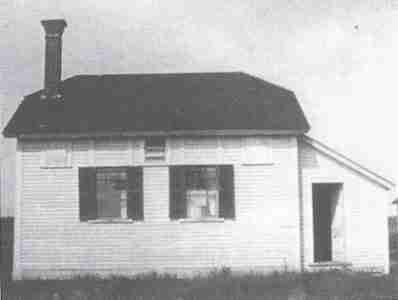 Two Quarantine Hospitals were erected on Middle Island in 1873, the year that Middle Island was purchased by the Dominion Government as a site for a permanent quarantine station. By 1875, with fewer instances of ships entering the Miramichi carrying contagious diseases, the necessity for isolated quarantine hospitals had lessened greatly. Such being the case, the Middle Island Quarantine Station was turned over to the Department of Marine and Fisheries under the condition that the use of the hospitals would be voluntarily turned over to the Board of Health if a quarantine emergency arose. Following this agreement the hospitals were used intermittently when an isolated area was required for quarantine purposes. The hospitals remained on Middle Island under the charge of the caretaker. In 1948 all the buildings on Middle Island were declared surplus to the government’s requirements and were offered for sale. After the buildings on Middle Island were sold and removed, the Island was declared surplus to the requirement of His Majesty the King. In 1950 the Department of Lands and Mines of the Province of New Brunswick purchased Middle Island along with the wharf on the mainland, for the sum of twelve hundred dollars. In 1967 Middle Island was made accessible to all when the Province constructed a causeway connecting it to the mainland. The following year, work began on a proposed Provincial Park. Ruins and foundations of old buildings were cleared and new park buildings erected. The Island remained a Provincial Park until 1994. 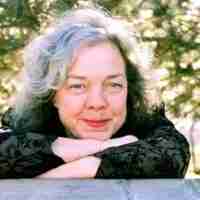 In 1983 under the leadership of Farrell McCarthy, the Irish Canadian Cultural Association of New Brunswick was formed. 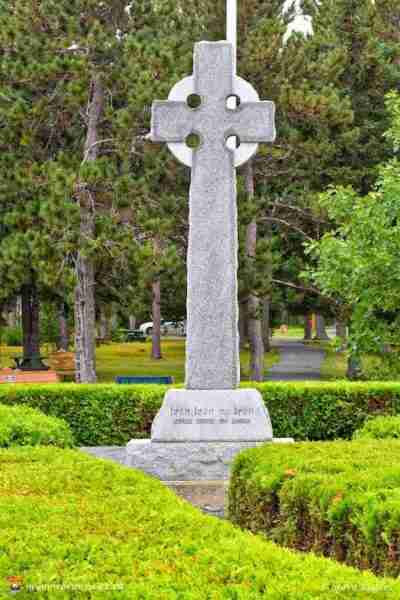 Irish Festival Inc. was incorporated in 1984, and that year a large Celtic Cross was erected on the Island. It was dedicated to the memory of the immigrants who died and were buried on Middle Island in 1847. Ireland’s Ambassador to Canada, the Honorable Sean Gaynor, unveiled the cross and it was blessed by Most Reverend J. Edward Troy, Coadjutor Bishop of Saint John. In June 1994 Middle Island became the responsibility of the Town of Chatham, when a 25 year lease was signed between the Town of Chatham and the Province of New Brunswick. In November 1994 Middle Island was designated as a Provincial Historic Site under the authority of the Historic Sites Protection Act. 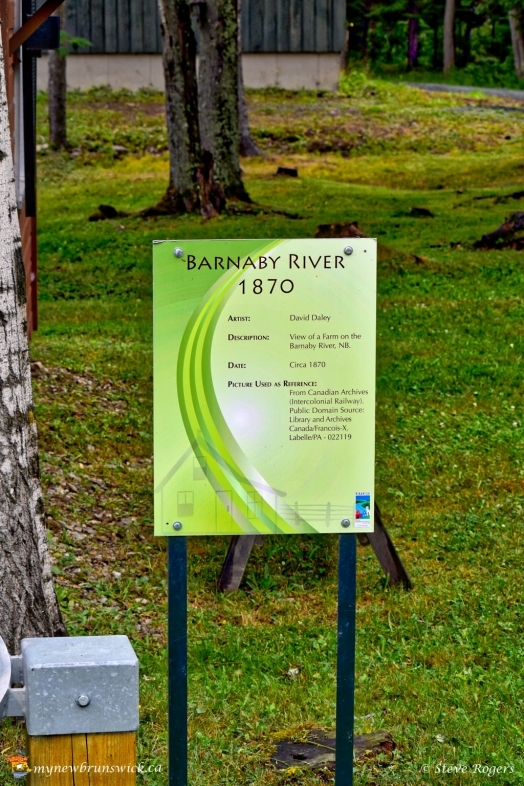 In 1995, to designate the site, a plaque was placed on the Island. 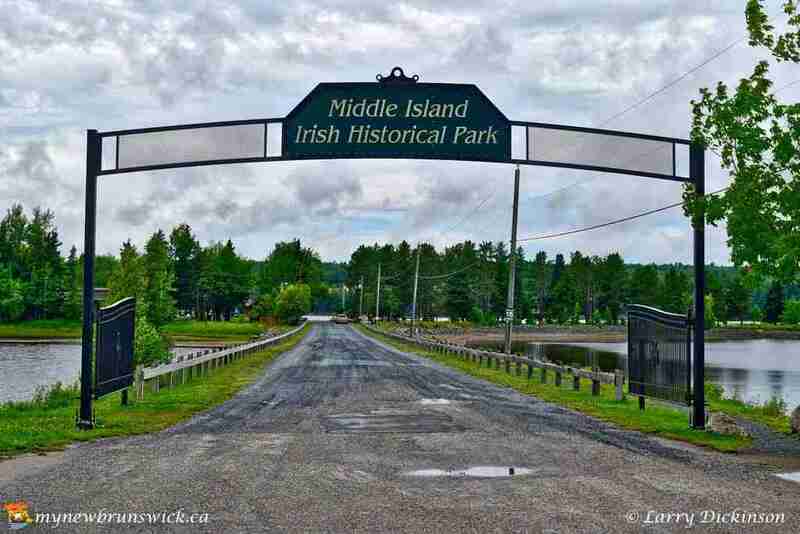 In 1996 the Middle Island Irish Historical Park Inc. came into being and was incorporated in 1997. The mandate of the group was to oversee the development of Middle Island into an Irish Historical Park. In 1997 a new headstone was placed at the site of Dr. John Vondy’s burial plot and in that same year the Irish Festival Inc. placed a flagpole inside the shamrock shaped hedge on the Island. 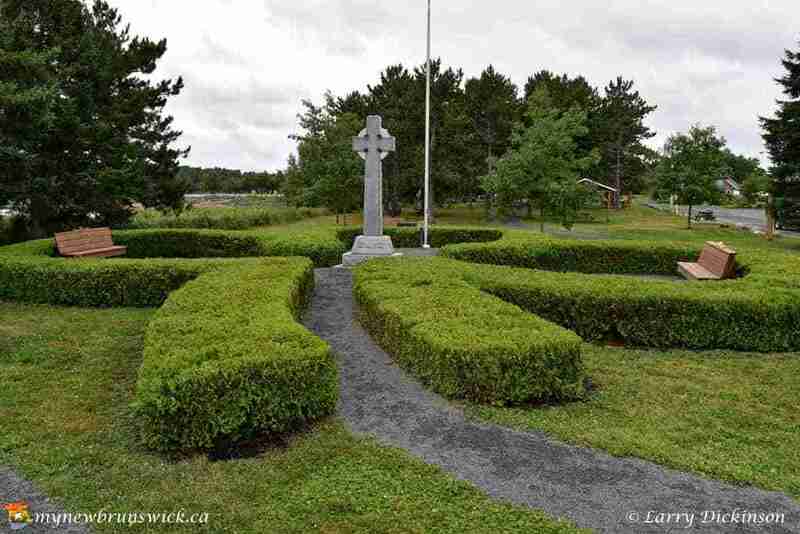 Also in 1997 a Commemorative Meadow, in the shape of a Celtic Cross, was built by the Middle Island Irish Historical Park Inc. In 1998 Miramichi City twinned with County Monaghan in Ireland. Several old photos were taken from the book “Middle Island Before And After The Tragedy” by Caroline Daley and Anna Springer. This post has already been read 2015 times!